Sunshine State Sarah: Hey Congress, check this out! I have done my darnedest to avoid learning what exactly this "Honey Boo Boo" phenomenon is all about. I certainly never planned to blog about the show. Now, I'm not claiming that my television viewing is any more intellectual than anyone else's, but every time I've seen that annoying kid screeching and making weird faces in the commercials, all I want to do is grab the remote control as fast as I can. 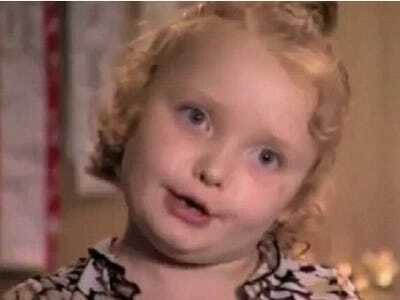 According to People.com, "Mama" June Thompson, the mother of the child for whom the show is named (seven year old Alana Thompson, aka "Honey Boo Boo"), has been putting most of the earnings from the show into five equally divided trust accounts for her four daughters (including Alana) and her granddaughter. The funds will be kept in each girl's trust until she turns 21, with the only exception being school expenses or medical emergencies. With each episode of the show paying an estimated $15,000 to $20,000, "Mama June" has established very nice nest eggs for her girls. "You're never gonna see me drive a Range Rover or a Mercedes...Never gonna live above my means." So let me get this straight: the family is living within their means, not buying unnecessary luxuries that they might enjoy, and is diligently saving money for the future, making sure those funds are spent on priorities? Can we get this "Mama June" to run for Congress?! Yeah, think about it: "Mama June," the woman shown dancing emphatically in the picture below, has better financial sense than the chuckleheads who are running our government. She's saving for the future while Congress is skirting the edge of fiscal cliffs and smacking their heads on ever-higher debt ceilings and whatever other scary metaphor we're using this week to represent the fact that they are spending too darn much. Indeed. Our sixteen trillion dollar debt makes me want to holler, but maybe that's just me. Gateway Pundit | If Honey Boo Boo’s Mama June Gets It – Why Can’t Obama?